Learn to sail with Her Ladyship Sailing, offering women sailing courses in Annapolis, the Florida Keys, the Bahamas and more! Learn to sail while vacationing at the enchanted grounds of the Ocean Pointe Resort located in the beautiful Florida Keys. From sunrise to sunset you can enjoy the many activities Ocean Pointe has to offer or just relax in your oceanfront suite and surround yourself with their tranquil environment of sixty acres of tropical elegance in the Fabulous Florida Keys! Your vacation begins the moment you drive through their gatehouse entrance into their beautifully landscaped tropical grounds and enter your spacious one or two bedroom suite. Your spacious 1 or 2 bedroom suite accommodations will include a whirlpool tub in the master bath, a fully equipped kitchen, and a private balcony. Have breakfast in the cozy water front café, use their free lighted tennis facilities, swim in their huge heated pool, get some sun on their private beach, rent a kayak, or just take a walk along their private boardwalk and marina. The marina, with a boat ramp, capable of handling craft up to 28ft, attracts many boaters to Ocean Pointe. 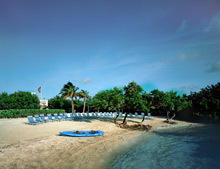 Fine restaurants and shopping are just minutes away, along with boating, fishing, snorkeling, diving, and parasailing. Everything you could want for the perfect Keys vacation! The pleasure of adventure, relaxation and fun while learning to sail and cruise aboard a 25’ daysailer. Our vacation package options are listed below. Call 305.942.9645 or email info@sunshinesailing.com for more information. Come and learn how to sail a 25-foot sailboat while staying at the enchanted Ocean Pointe Resort. This introduction course will navigate you and your family thru the basics of sailing while cruising around the majestic Caribbean turquoise water of the Florida Keys. Become a competent day sailor and feel comfortable taking the helm for an adventure of a lifetime. This popular course is a 2-day learn to sail that will give you a taste of the sea, the sailing and the adventure you have been craving. Thank you for choosing Her Ladyship, offering women sailing courses around the globe.